Hundreds Of Migrants Released In The Rio Grande Valley The mayor of Brownsville, Texas, was told to expect close to 6,000 migrants released in the Rio Grande Valley this week. A local shelter has been taking in hundreds each day. The Good Neighbor Settlement House, a homeless shelter in Brownsville, Texas, is now also being used to house migrants released from U.S. Customs and Border Protection custody. They normally help a couple dozen migrants a day, but recently the numbers shot up to more than 400 a day. We don't intend to back off of the mission we embrace. They can keep sending them, we're going to serve them. The migrants are brought here for a short period of time and can shower, eat and get some clean clothes. Volunteers help migrants work out travel arrangements so they can meet up with relatives or sponsors in other parts of the country while they await their day in immigration court. 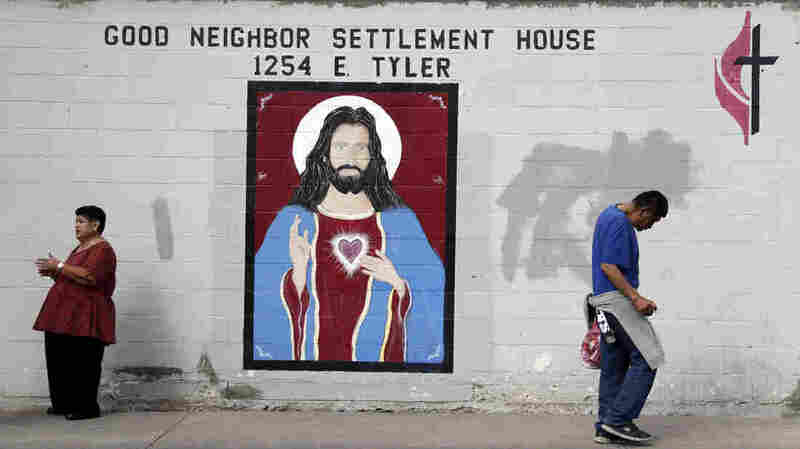 All along the Texas border, cities are dealing with an unprecedented influx of migrants. 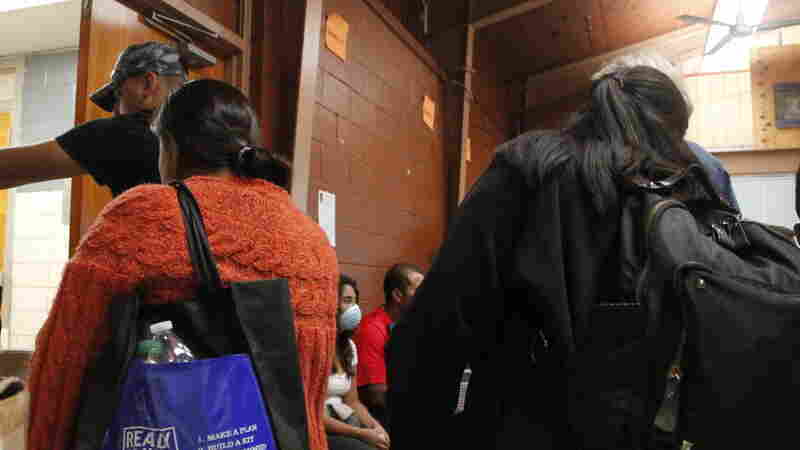 Migrants line up inside Good Neighborhood Settlement House in Brownsville, Texas, as they are about to board a vehicle and head to a local airport. The shelter started their Refugee Respite Program in August at the request of Catholic Charities of the Rio Grande Valley. Jack White, the director of Good Neighbor, says he's recently seen a spike in numbers and they are no longer receiving advance notice from CBP when migrants are being released. Still, White says, they're dealing with it. "Will it be hard?" asked White. "Yes, but we don't intend to back off of the mission we embrace. They can keep sending them, we're going to serve them." Migrants usually arrive at the shelter with some documentation about relatives or sponsors to contact to arrange shelter while they await their immigration court proceedings — that wait can take months, even years, because of the huge backlog of cases. But Marianela Ramirez-Watson, the director for the Refugee Respite Program, says last weekend they ran into a new problem. "A group of people showed up without their paperwork and so the minute we caught it we called CBP and they said, 'Oh my gosh, they weren't supposed to send that bus yet,' " said Ramirez-Watson. "Some confusion when you're dealing with as many people as they are." While local organizations, like Good Neighbor, handle the releases, the Trump administration continues to call on Congress to change immigration laws to stave off what they consider a national emergency at the border. But César Cuauhtémoc García Hernández says the real crisis isn't with people asking for asylum, it's with the immigration system itself. García Hernández is an associate professor of law at the University of Denver and a Rio Grande Valley native. He said it's important to point out that this administration has already made some changes in an effort to limit the number of asylum-seekers. "[In the past] a person could make a claim, a successful claim for asylum based on abuse by a violent spouse. Or because of violence being inflicted by the gangs that are destabilizing much of Central America," said García Hernández. "The Trump administration has made it almost impossible to make those claims." Still, the asylum-seekers keep coming. As Good Neighbor braces for more, Brownsville's mayor, Tony Martinez, said his city has adapted to the challenge pretty well. Martinez said CBP said to expect nearly 6,000 migrants across the Rio Grande Valley this week. "I've been in situations where there is no way to control something, whether it's a health problem, or otherwise, and you really feel helpless and overwhelmed and you're at your wits' ends," said Martinez. "Here, because of the community coming together, we lift each other's heart to meet the occasion." Meanwhile, CBP announced Thursday that construction of 13 miles of new border wall in the Rio Grande Valley will begin this month.